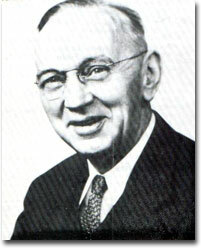 Edgar Cayce - "The Sleeping Prophet"
"Forget not this: 'As ye do it unto the least of thy fellow men, ye do it unto thy Maker,' and ye must give an answer in thy activities for that thou hast given or dost give in thy dealings with thy fellow men. For, 'As ye sow, so shall ye reap.' This is not merely an axiom but a LAW that must be accomplished in the experience of each and every soul!" "Be true to self and those things that are prompted from an ideal; not as to what may be called the ideal of the "gimmies" but rather giving; remembering that God so loved the world as to give His Son. Then, the least thou canst do for thy fellow man is to give thyself in a service that will render unto Caesar the things that are Caesar's, as it were, but SURELY unto God the things that are God's! Study to show thyself approved, then; a workman not ashamed in whatever field of service thou hast chosen or dost choose; but in those activities as indicated may the best service be rendered; and keep self unspotted from condemnation of self and thy fellow man." Question: What kind of clay do you prescribe: red clay or white clay? Question: How would it be prepared? Edgar Cayce: It is already prepared. Question: Put the clay to her spine? Edgar Cayce: From the 2nd cervical and the ninth dorsal. Applications at the time of rest, producing a drawing, or a cortex producing a reaction or retarding or restimulation to the effects to the nerve supply at the time of repose. Edgar Cayce: Now much of the conditions that are abnormal have to do with prenatal conditions and effects this has brought to the body, and in the structural development, with effects that have been produced in the body. Some of these conditions are effects of these and may be relieved and brought to a better developing or manifesting in the body. Others may be in time, through care and attention, assisted in their being or giving relief to the body. These, we find, may be reached more thoroughly by relaxing the whole cerebrospinal system, and with the locomotories, especially centers, by the relaxing these with clay, as would be prepared from the stream that lies South and West from this place, close to where the railroad crosses this excavation. The mud and clay as taken from this would be applied at least every second day to the whole cerebrospinal centers, and this to remain for at least three to four hours, or until the property has had time to add the healing forces and drawing from system those absorbed conditions that bring much relief to affected conditions, both in structural and in ligament and tissue, for one adds and the other detracts from the conditions. When these are removed, then the body should be gently massaged until alignment can be nearer made in and for the body. When this has been kept for three to five weeks, we would then give from here those conditions necessary to be met at that time. As we find, there is a complication of disturbances. These arise from more than one cause. And one becomes a contributory cause to the other; thus producing other disturbances through this combination of causes. There have been pressures in the system, and after effects of disturbances when there became an involvement of tissue through the lack of proper circulation through portions where adherence in soft tissue produced a lesion and scar tissue. Then, with the effect of changes in the body through the lack of eliminations, or the changing of same - or during those periods of menopause, there became then - through this gradual change - an excess of calciums, and the effect of the potash that had not been absorbed by the body. Hence we have in the extremities, in the pressures in the body, in the various portions of the system, this combination of effects. It would be well first to seek the Mud from streams nigh to the body. But that from the clay, rather than the sands. # This, as we find, (the Mud or Clay) would be applied to the body along the area from the lumbars to the area between the shoulders, along the spine; or from the sacral to the cervicals. This we would apply and use for periods of two or three hours at the time, until this has AFFECTED the system - as it were - by the DRAWING that is effected by mud in this PARTICULAR portion of the country. As we find, this will be found out from Dayton, north, and where there have been playgrounds - and swimming pools. This mud or dirt here, at the cliff, may be taken, dried, ground, purified by standing in water and taking the dross off; and then made into the form of an antiphlogistian poultice (though this, of course, is not of the same nature; but is of the same character or CONSISTENCY). ...Question: How thick should the Mud Packs be? Edgar Cayce: About a quarter of an inch thick. They may be covered with a cloth on top, you see (though the Packs are to be direct to the body, on the skin), to prevent too much destruction to the bed or the places where the body lies. They all think the reading is very good. The trained nurse has read similar readings [of yours] but says nothing to compare with this. The Doctor says it is perfect, and is for it. Overlook Park and playgrounds is north of Dayton, Ohio, near W. Milton. Mr.  says had you been there you could not have described it better. There was the cliff, the springs, (a stream of water running down over) under the cliff the nicest dirt you could ever find, not even any frost on it, and within ten feet one way old wet mud and ten feet the other blue clay. Edgar Cayce: Obtain the earth from the Ohio area, - near Dayton, in Overlook Park, the strata near the bridge, as will be indicated from observation - being different in color from that around same. It is on the left side (if one is facing the river) from the little bridge over the ravine there. Take this earth, put it in a glass container and heat in the oven for one hour - at five hundred and forty (540) degrees of heat. Then pulverize it and mix with Peanut Oil to make an ointment. Use this as an ointment on the areas affected, rather than that which has been supplied - or suggested. Make the mixture just so it works into a good paste, see? Or: Obtain the raw material - after being washed and baked once - from the talc mine near Jacksonville, Alabama. This would not require heating, but might be used in the raw form before being bolted the second time for purification; for it will have already been purified by washing and heating, to be sure. Mix this with the Peanut Oil and use as an ointment. 2/11/42 Letter from Leona McClelland: "Last Sunday we went to Overlook Park and got a bucket of clay and sent some to Mr.  in Youngstown. We also explained some to the man who owns the park, about you and the clay, etc. - that it might be worth something. He did not charge us for it and hopes it helps the man, to let him know if it helps was all he asked. Told him he could write you if he wished. It is a blue putty looking clay." About a year and a half ago you gave my husband Mr.  a reading. He had a rash on his hands what the doctors termed eczema. He followed instructions fairly close and last summer it didn't break out at all. Now it is beginning to break out again and I didn't know what to do. So I thought I would write to you. He may need another reading so will you please let me know what he should do as soon as possible as it seems to be getting a little worse all the time. I got his other reading out and followed it as closely as is possible again but there seems to be something he lacks. I'll appreciate to hear from you as soon as possible. Edgar Cayce: Now, we find there are many abnormal conditions with this body. Many of these may be changed or corrected by following closely, carefully, prayerfully, those conditions as will bring about for the physical forces of the body that which will bring to the rebuilding forces that as is necessary for the successful coordinating of the organs and functionings thereof of this body. Apply each evening to the whole cerebro-spinal system, from head to foot (of spine, see?) - that is, 1st cervical to the end of the coccyx those of mud - clay mud, which may be obtained in the outskirts of the city here [Newark, Ohio? ], where clays are compiled or bound to-gether, see, in brick form. Use this mixed with oil and water, see? That is, mix the clay, then apply sweet oil with same after mixing. Apply to the body. Let this remain for three to four hours. Cleanse off and rub the spine briskly after cleansing with equal parts of Olive Oil and Tincture of Myrrh, see? heating the oil and pouring Myrrh in same, see? When this has been done, and the body ready for rest, apply those vibrations for equalization of circulation and elimination, those vibrations from the plain Radio-Active Appliance, for at least two hours, see? giving the positive to the ankle and alternating same to wrist, see? That is, making first attachment one day to wrist, the next to the ankle, see? 1/10/27 Wife wrote: "I have followed all directions as you requested and my husband says he can not see any improvement at all, does not walk or talk as well as he did before he had the reading. I am very sorry to write this." 1/17/27 EC wrote asking if she was sure she had followed the entire treatment, including the Radio-Active Appliance [which she did not order from Mr. Thos. B. Brown in Dayton, O., who was then making the Appliance], the medicine, mud pack and massage, and diet.
" If he does not improve soon, by the continued following of the tr., please let us know, for it is our desire to be of help, if possible. However, we cannot bring help to those who do not cooperate with us in following the suggestions given." Edgar Cayce: First, then, we would begin with the use of applying the red clay packs upon the lower portion of the spine - upon the 4th lumbar, upon the 1st, 2nd, 3rd and 4th dorsal, about once each week. The clay should be of the red nature that is in the vicinity across the river from the home of the entity, where brick are made. This would be worked with sufficient of the water (of the same river) to make not exactly loblolly, but a stiff clay - see? Apply directly to the skin over the areas indicated, about once each week. Of course, in the lumbar area it would cover the 3rd and 4th and the upper portion of the sacral, you see. That in the upper portion of the body would cover the 1st, 2nd, 3rd and 4th dorsal, as indicated. Also a pack over the lower portion would cover the whole of the coccyx end, or the lower portion of the sacrum and over the end of the spine. When the packs have remained on the body for one hour, they may be massaged off or cleansed by the use of an alkaline solution, or soda water - baking soda water; a tablespoonful to two quarts of water, warm. Question: How thick should the clay be put on? Edgar Cayce: About half an inch in thickness. In width, not more than two to two and a half inches; along the spinal area - not crosswise of same. Edgar Cayce: Yes, we have the body here, Mrs. . Now, we find there are abnormal conditions with this body. These conditions have to do with specific conditions existent in the physical forces of the body and the effect this has produced on the functioning organs and upon the system in general. Many are the conditions as may be given as being unusual, out of the ordinary, with this body, in the mental and in the physical effect as is produced. ...The body in the mental sense COULD have been directed in the manner wherein - here's where we find a variation in that as is presented through what may be termed the application of physical self and of will, to that as is predestined through that of the relationship of an individual to a universal force, or the difference between that of astrological and physical conditions existent: In the meeting then, through the needs of this body at the present time, were there applied the proper character of heat to the whole of the lumbar and the lower dorsal region - which, as we find, would be MUD, that would be made from Fuller's Clay - this warmed (not so it would BURN the body, but warmed) and applied, and allowed to stay OVER the night, see? In the morning it should be cleansed - sponged off, then thoroughly rubbing the body with equal parts of olive oil and tincture of myrrh.